X It is timid and always curls itself up in a ball. If attacked, it flares up its back for protection. X Es ist ruhig und kugelt sich stets zusammen. Zum Schutz entflammt es seinen Rücken. X Il est timide et se roule en boule pour se protéger. Attaqué, il s’enflamme le dos pour riposter. X Es tímido y siempre se enrosca como una pelota. Si es atacado, enciende su lomo para protegerse. X Spesso se ne sta appallottolato giacché timido. Se è attaccato, si difende infuocando il dorso. X 겁이 많아서 늘 몸을 웅크리고 있다. 습격당하면 등의 불꽃을 타오르게 해서 몸을 보호한다. Y It has a timid nature. If it is startled, the flames on its back burn more vigorously. Y Erschrickt sich dieses scheue Pokémon, lodern die Flammen auf seinem Rücken kräftiger. Y Ce Pokémon est un grand timide. Les flammes sur son dos s’intensifient lorsqu’il prend peur. Y Es un Pokémon muy tímido. Si se asusta, las llamas de su lomo arden con más fuerza. Y È riservato per natura. Se viene spaventato, le fiamme sul suo dorso bruciano ardentemente. Y 겁쟁이 같은 성격이다. 놀라면 등의 불꽃이 한층 더 강하게 타오른다. 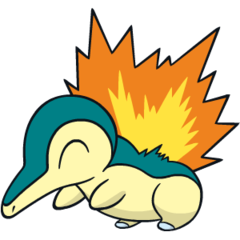 Omega Ruby Cyndaquil protects itself by flaring up the flames on its back. The flames are vigorous if the Pokémon is angry. However, if it is tired, the flames splutter fitfully with incomplete combustion. Omega Ruby Feurigel lässt Flammen aus seinem Rücken lodern, wenn es sich schützen muss. Die Flammen sind sehr stark, wenn dieses Pokémon wütend ist. Ist es aber müde, flackern die Flammen nur unregelmäßig und schwach. Omega Ruby Héricendre se protège en faisant jaillir des flammes de son dos. Ces flammes peuvent être violentes si le Pokémon est en colère. Cependant, s’il est fatigué, seules quelques flammèches vacillent laborieusement. Omega Ruby Cyndaquil se protege soltando llamas por el lomo. Cuando está enfadado, las llamas son fieras, pero, si está cansado, solo consigue echar algunas chispas que no llegan a cuajar en una completa combustión. Omega Ruby Cyndaquil si protegge grazie alle fiamme che gli ardono sul dorso. Le fiamme divampano impetuose se il Pokémon è adirato. Tuttavia, quando è stanco diventano fiammelle innocue dalla combustione incompleta. Omega Ruby 등에서 불꽃을 내뿜어 몸을 지킨다. 화났을 때의 불꽃은 기운차지만 지쳤을 때는 불완전연소한다. 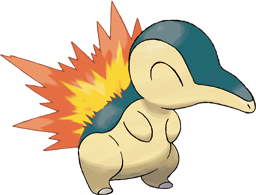 Alpha Sapphire Cyndaquil protects itself by flaring up the flames on its back. The flames are vigorous if the Pokémon is angry. However, if it is tired, the flames splutter fitfully with incomplete combustion. Alpha Sapphire Feurigel lässt Flammen aus seinem Rücken lodern, wenn es sich schützen muss. Die Flammen sind sehr verzehrend, wenn dieses Pokémon wütend ist. Ist es aber müde, flackern die Flammen nur unregelmäßig und schwach. Alpha Sapphire Héricendre se protège en faisant jaillir des flammes de son dos. Ces flammes peuvent être violentes si le Pokémon est en colère. Cependant, s’il est fatigué, seules quelques flammèches vacillent laborieusement. Alpha Sapphire Cyndaquil se protege soltando llamas por el lomo. Cuando está enfadado, las llamas son fieras, pero, si está cansado, solo consigue echar algunas chispas que no llegan a cuajar en una completa combustión. Alpha Sapphire Cyndaquil si protegge grazie alle fiamme che gli ardono sul dorso. Le fiamme divampano impetuose se il Pokémon è adirato. Tuttavia, quando è stanco diventano fiammelle innocue dalla combustione incompleta. Alpha Sapphire 등에서 불꽃을 내뿜어 몸을 지킨다. 화났을 때의 불꽃은 기운차지만 지쳤을 때는 불완전연소한다. Gold It is timid, and always curls itself up in a ball. If attacked, it flares up its back for protection. Silver It usually stays hunched over. If it is angry or surprised, it shoots flames out of its back. Stadium2 It is timid, and always curls itself up in a ball. If attacked, it flares up its back for protection. Ruby Cynadquil protects itself by flaring up the flames on its back. The flames are vigorous if the Pokemon is angry. However, if it is tired, the flames splutter fifully with incomplete combustion. Sapphire CYNDAQUIL protects itself by flaring up the flames on its back. The flames are vigorous if the POKeMON is angry. However, if it is tired, the flames splutter fitfully with incomplete combustion. Emerald It flares flames from its back to protect itself. The fire burns vigorously if the POKeMON is angry. When it is tired, it sputters with incomplete combustion. Diamond It has a timid nature. If it is startled, the flames on its back burn more vigorously. Pearl It has a timid nature. If it is startled, the flames on its back burn more vigorously. Platinum It has a timid nature. If it is startled, the flames on its back burn more vigorously. Black It has a timid nature. If it is startled, the flames on its back burn more vigorously. White It has a timid nature. If it is startled, the flames on its back burn more vigorously. White 2 It has a timid nature. If it is startled, the flames on its back burn more vigorously.